Facebook: Works on all these MyGicas: 380, 520, 520e, 582, 585, 1200 (2014 Edition+), 1800e. Item 874c: $19.95Can or $15.35us Brand New. 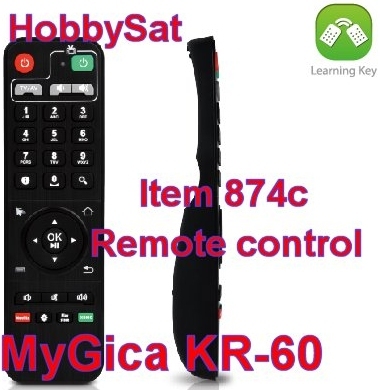 MyGica KR-60 official original factory replacement IR remote control for MyGica ATV 1200, ATV 1800e, ATV 582, ATV585. XBMC/Kodi remote control designed for XBMC/Kodi TV Boxes. Easily navigate through XBMC/Kodi with preset functions in the palm of your hands. Reach: 10 metres or more. 6.7x2.0x0.9 inches. 48x170x23 mm. Shipping Weight: 68 grams. 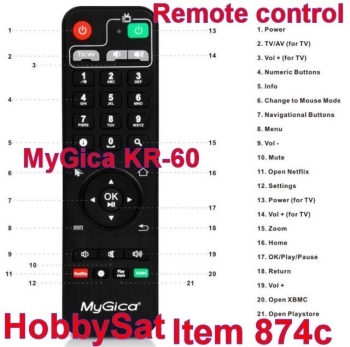 MyGica KR-60 Official Original Factory Replacement IR Remote Control for ATV 1200 (2014 Edition+). MyGica KR-60 also works with ATV 380, 520, 520e, 582, 585, 1200 (2014 Edition+), 1800e. Now in stock. Discount for more than one. "I got this remote for my MyGica players and it works ok on all of them. Thanks to HobbySat for being patient with my efforts to get the right remote...."
Alicia S., November 22, 2015 Halifax, N.S. Why risk buying generic brands for a few dollars cheaper? MyGica has Factory support with automatic updates. Best of all the MyGica comes with 1 year warranty in North America!!!! Android is the World’s leading Mobile and Tablet Operating System. This means No Learning curves for Android users. and share it with all your Android devices or vice versa. Download from Millions of Apps, Games, Books, Movies and more on the Google Playstore. Surf the Internet, Stream Movies, Read Ebooks, Play Games, Video chat and much more from your TV. MyGica Android Boxes are Easy to Use and provide Endless Entertainment. Warranty plus hardware failure replacement. 30 years selling electronics in Halifax. Free Delivery in Halifax on this item. Free Shipping. Order here or online from HobbySat. MyGica an expert in TV products, delivering the consumer the ultimate experience of watching internet television. Manufacturers of the highest quality Android TV Boxes including the Jynxbox Android, Pivos XIOS DS and MyGica Products. 1 year warranty and support. HobbySat carries the North American versions of MyGica Products. Stop paying overpriced Cable or Satellite TV. Tired of being forced to pick high cost packages, just to get the channels you want? Frustrated at paying for equipment rentals from your provider? Go with a company who's got your back. HobbySat is the home of media players, Android TV, IPTV, TV Antenna stuff and Free to Air Satellite. We beat all other prices for the gear you need for many years now. etc. we can offer you a deep discount to help you.